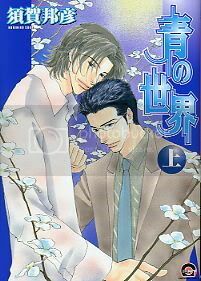 Ao no Sekai by SUGA Kunihiko - Anta baka? oh yay, you did fushichou already, now i don't have to fire up IRC and can just pop off an email to say thanks. :) grabbed the lot of them. tnx much! merry christmas, should you be celebrating! happy slouchdays if not! Merry X'mas dear Pleo thank you for being such a great member of the Forum and thank you for always being lovely to me.May you be healthy happy loved and among good friends in 2008. I can't even take credit for that, since I'm too lazy to use IRC these days. But I got one of those weird-uber-secret-darknet invites (I've supposedly been labeled a "moral pirate", whatever the heck that means), so it's much easier to get a hold of everything. If I wasn't scared of getting caught and booted, I'd be able to help you preview almost every frickin' manga released. I swear, some of these people must work for the publishers, with how quickly they release. At least it seems like it all trickles down eventually. Awesome! Love, love, love FW. I still have $300 in Micropay to spend, but nothing much I've been crazy about buying lately. It's fun to use for the quick ebook gift, though. You'll need to share your wishlist with me.